Japan hit the gold medal trail on the final day of the Junior World Championships individual competition to finish as the runaway leaders of the medal table in Nassau, Bahamas. Japan finished with a incredible medal haul of seven gold, six silver and five bronze ahead of Italy who won three gold medals. 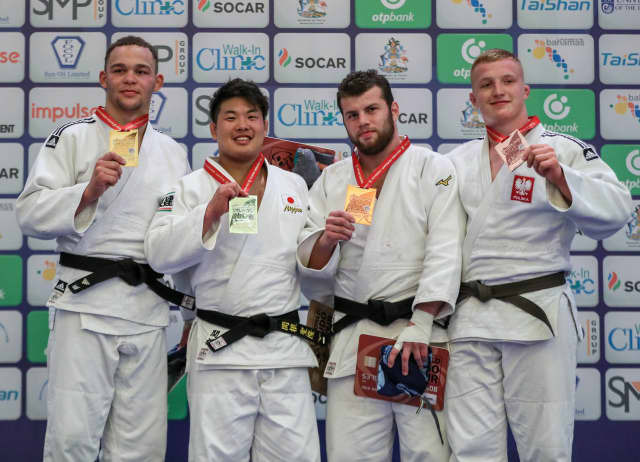 Judo’s universality was on display to the world as 26 countries medalled in the four-day individual event with the mixed team event set to provide a thrilling finale to the Junior World Championships 2018 on Sunday. Rome European Open gold medallist WADA Rinoko (JPN) defeated Junior European championships bronze medallist Karla PRODAN (CRO) in the -78kg final to set Japan off for a treble on day four. Croatia’s 2015 Cadet World Championships winner was thrown with an o-soto-gari on two occasions as WADA sealed gold with 25 seconds left on the clock. In the first semi-final WADA defeated Junior Pan American Championships winner Camila PONCE (BRA) with osaekomi-waza as the Brazilian was unable to escape a yoko-shiho-gatame hold. In the second semi-final 2017 Junior World Championships silver medallist Teresa ZENKER (GER) lost out to PRODAN in golden score by ippon from a o-uchi-gari. The first bronze medal was won by Junior European Championships winner Patricia SAMPAIO (POR) who beat ZENKER with 17 seconds left on the clock. SAMPAIO broke the deadlock with a waza-ari score and added a second with a seoi-nage to match her result from 2017. The second bronze medal was claimed by Glasgow European Open silver medallist Shelley LUDFORD (GBR) after PONCE was disqualified for a waki-gatame. LUDFORD made sure that the British team medalled in the Bahamas on the last day of the individual competition. 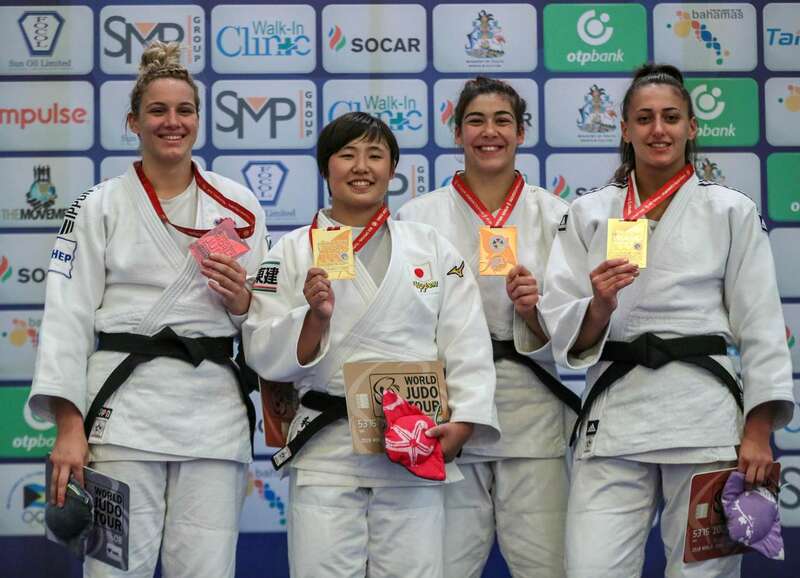 KODAMA Hikaru (JPN) ousted Cancun Grand Prix bronze medallist Beatriz SOUZA (BRA) to win her first Junior World Championships title in the Bahamas. KODAMA, who took silver a year ago, took the contest to SOUZA, who is ranked number 10 in senior heavyweight category and is a contender for the Tokyo 2020 Olympics. KODAMA threw with a uchi-mata for a waza-ari score and then pinned her Brazilian rival for 10 seconds to win gold. In the first semi-final 2017 Junior Asian Championships gold medallist Kamila BERLIKASH (KAZ) was beaten by SOUZA with a thunderous o-soto-gari which earned ippon with a minute left on the clock. 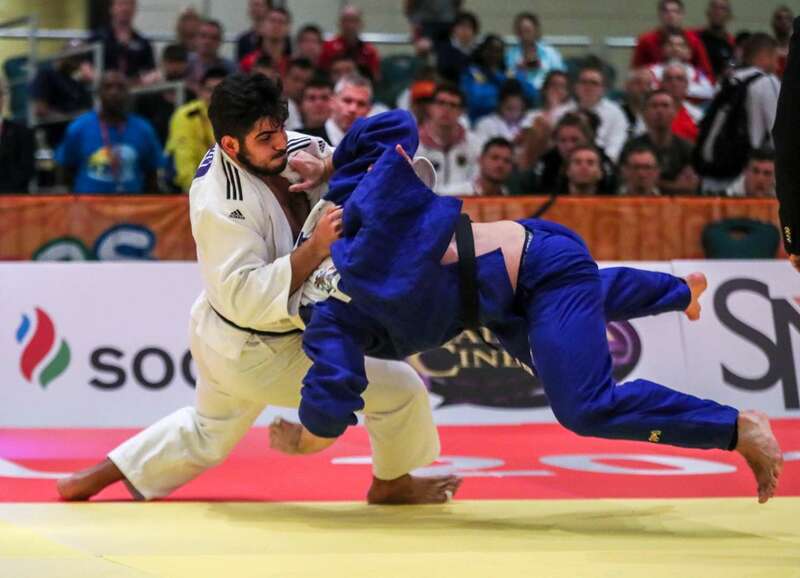 In the second semi-final Junior European Championships winner SZIGETVARI Mercedesz (HUN) was thrown with an uchi-mata for ippon by KODAMA. The first bronze medal was claimed by one-time Junior European Cup winner Laura FUSEAU (FRA) who edged past SZIGETVARI by a waza-ari score from a uchi-mata. The second bronze medal was won by Junior European Championships silver medallist Renee LUCHT (GER) after BERLIKASH was penalised for the third time in golden score. The Kazakh had her German rival trapped in a kesa-gatame but the latter managed to wriggle out to remain in the contest. LUCHT won Germany’s first medal in the Bahamas by marginally outworking her opponent who was reprimanded with a shido for a false attack. 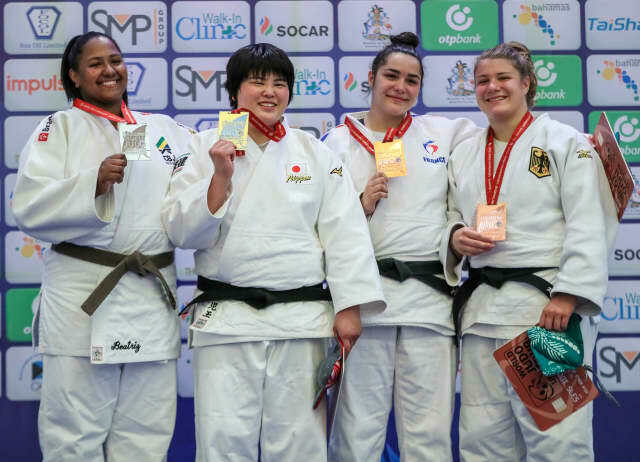 One-time Junior European Cup winner SEKINE Kiyotaka (JPN) was crowned the Junior World Championships gold medallist after victory over 2015 Cadet World Championships gold medallist Simeon CATHARINA (NED) in the -100kg final. SEKINE was the more positive judoka as he attacked relentlessly but struggled with the much larger frame of the more well-known Dutch judoka. Golden score was summoned to produce a winner and it went Japan’s way as SEKINE finally registered on the scoreboard after 17 additional seconds with a ko-uchi-makikomi which earned a waza-ari score. In the first semi-final two-time Junior European Cup medallist Iwo BARANIEWSKI (POL) fell to SEKINE by ippon from a ko-uchi-makikomi with 48 seconds left on the clock. In the second semi-final CATHARINA countered a weak uchi-mata from Onise SANEBLIDZE (GEO) for a waza-ari score after 23 seconds of golden score. The first bronze medal was won by SANEBLIDZE with a Georgian special as he hulked up to lift Santo Domingo Pan American Open winner Shady ELNAHAS (CAN) up with a gigantic ura-nage for a waza-ari score at the halfway point. ELNAHAS valiantly searched for a score but SANEBLIDZE acquitted himself well and his impressive contest management skills saw him home. The second bronze medal was won by BARANIEWSKI in a lively clash against two-time Junior European Cup winner Mathias MADSEN (DEN). The 1st Kyu brown belt from Poland timed his score to perfection as he picked up a waza-ari score with just two seconds left on the clock from a harai-makikomi. 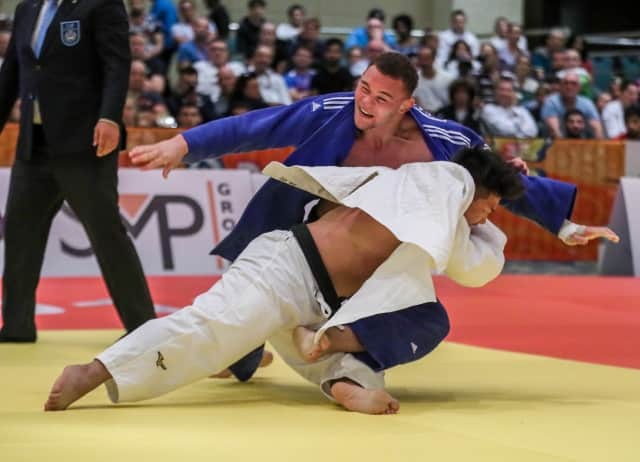 Junior European Championships gold medallist Gela ZAALISHVILI (GEO) won the last contest in the individual competition as he bested Budapest Grand Prix silver medallist Stephan HEGYI (AUT) in the +100kg final. After Guram TUSHISHVILI (GEO) won the senior world title in Baku, Azerbaijan, last month, Georgia showed that they have more highly-exciting heavyweight prospects in their ranks. HEGYI, who is ranked 10th in the world on the senior ranking list, was thrown for a waza-ari and held down for 10 seconds as ZAALISHVILI recorded a stylish win to hand his country their second gold medal in Nassau. In the first semi-final Berlin Junior European Cup silver medallist Dzhamal GAMZATKHANOV (RUS) flew through the air from a sode-tsurikomi-goshi for ippon by ZAALISHVILI. In the second semi-final HEGYI bested Junior European Championships silver medallist Erik ABRAMOV (GER) who was penalised for the third and final time in golden score to secure a place in the +100kg final for the second year in a row. 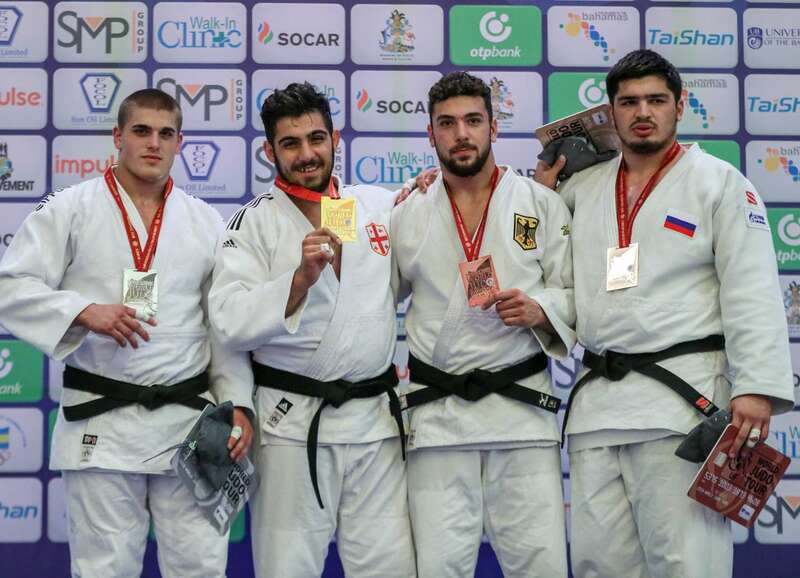 The first bronze medal was claimed by ABRAMOV who dismissed Junior European Championships bronze medallist Enej MARINIC (SLO) after just 42 seconds by ippon with a ko-soto-gake. The second bronze medal was captured by GAMZATKHANOV who outfought 2015 Cadet World Championships gold medallist Kemal KAITOV (RUS). GAMZATKHANOV is the son of the famed Magomedhan ‘Volk Han’ GAMZATKHANOV who was a leading name in the Japanese professional wrestling scene in the 90s and the revered father was matside in the Bahamas. GAMZATKHANOV won the all-Russian contest by rolling his teammate over for a waza-ari and KAITOV decided to tap out from the subsequent pin.